DNAinfo New York looked through hundreds of mayoral transcripts to find Bill de Blasio's most used words from 2014. NEW YORK CITY — Mayor Bill de Blasio used the word "police" in his speeches 274 times in December, as protests against the NYPD roiled the city and New Yorkers mourned two officers who were killed in an ambush. That was up nearly 10-fold from September, when de Blasio mentioned police just 30 times in his public addresses. DNAinfo New York analyzed 825,000 words de Blasio uttered in 314 mayoral speeches, appearances and question-and-answer transcripts in 2014, from his inaugural address on Jan. 1 to a swearing-in ceremony for probationary firefighters on Dec. 29. We found his most-used words: "City" was the mayor's favorite noun, uttered 5,014 times, followed by "people" (4,518 times) and "community" (1,328 times). DNAinfo shared the data — which discounts small words like "the" and "to" — with political analyst Basil Smikle, who noted that de Blasio favors inclusive language. "He has modeled himself as a new progressive voice that can bring communities together and he frequently used words to exemplify that," Smikle said. DNAinfo also tracked de Blasio's top words over time, to see how they reflected his changing agenda and mindset during his first year in office. The mayor mentioned "police" an average of about once a day during the first half of the year, but his use of the word spiked to more than three times that in July and August, fueled largely by discussion of Eric Garner's death in a police chokehold on Staten Island. His use of "police" fell off after that, only to soar again in December, as protests took over city's streets and the mayor was forced to defend himself against police union accusations that he had "blood on [his] hands" in the death of two police officers, Rafael Ramos and Wenjian Liu, who were shot in their patrol car on Dec. 20. In all, de Blasio mentioned "police" 856 times in 2014. That was just slightly more than the 829 times he spoke about "pre-K," a centerpiece of his mayoral campaign. 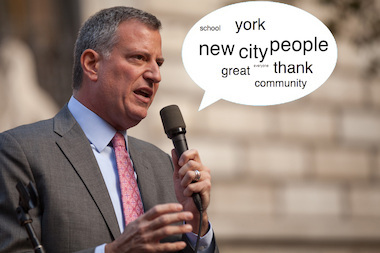 Other words and phrases tied to de Blasio's agenda didn't come close. He mentioned "affordable housing" 299 times and "Vision Zero," his traffic safety plan, just 88 times. And despite widespread media attention on Rachel Noerdlinger, his wife's former chief of staff, de Blasio mentioned Noerdlinger by her last name just three times in 2014. Smikle said it's not uncommon to see politicians avoid tricky subjects. "I think he's tried to downplay what could be bubbling up as a potential scandal and minimize the dialogue about it and refocus the conversation around it," he said. "It's something that a lot of leaders will do." And even though de Blasio moved to Manhattan in 2014, there was no mistaking his favorite borough. He said the word "Brooklyn" 371 times last year, compared to only 98 times for "Manhattan." ► De Blasio might be an optimist. "Great," "good" and "extraordinary" were each said more than 1,000 times. ► The mayor's most referenced family member was his wife Chirlane, with 190 mentions. His children Dante and Chiara followed at 101 and 81, respectively. ► De Blasio said the word "Garner" 21 times, as many times as "DNC." ► "Ebola" drew 98 mentions, the same number as "Manhattan." ► The mayor mentioned "Albany" (297 times) more often than "Queens" (178) and "Bronx" (108) combined. ► The word "progress" became the de Blasio campaign's buzzword in 2013, but in office he used it only 295 times. ► De Blasio said the word "change" more often the longer he was in office, from just 27 times in February to 127 times in December. ► Don’t say the mayor isn't polite. He said "thank" 2,658 times. *Note: The mayor's office did not begin releasing regular transcripts until February. As a result, word totals for the month of January may be under-counted.